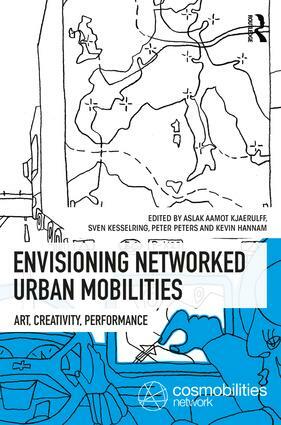 Envisioning Networked Urban Mobilities brings together scientific reflections on the relations of art and urban mobilities and artistic research on the topic. The editors open the book by setting out the concept grounded in the exhibition curated by Aslak Aamot Kjærulff and refers to earlier work on mobilities and art generated by the Cosmobilities Network. This third volume has two sections, both consisting of short papers and illustrations. The first section is based on artists who were part of the conferences' art exhibition, and the second part is based on theoretical reflections on art and artists. "In the emerging field of artistic research, sensory and embodied ways of knowing take center stage. At the same time, qualitative social scientists and geographers are developing a keen interest in new methodologies that draw inspiration from the arts. This timely volume on the nexus of arts and mobilities research stages an engaged dialogue between leading academic scholars and artists." "Unique in its approach, this brilliant collection of essays integrates the theoretical and methodological analysis of networked urban mobilities in ways that will reshape how scholars and practitioners engage philosophically and materially with emerging entanglements of artistic, scientific, and technological imaginaries in the twenty-first century." Aslak Aamot Kjærulff holds a PhD degree in Mobilities and Action Research from Roskilde University, Denmark. He currently organizes a transdisciplinary research and arts organization called Diakron and teach at Roskilde University. (with Saulo Cwerner and John Urry). Peter Peters is Assistant Professor in the Department of Philosophy in the Faculty of Arts and Social Sciences at Maastricht University, the Netherlands. He is trained as a sociologist and holds a PhD for his dissertation on mobilities in technological cultures, in which he combines insights from social theory and science and technology studies to analyze practices of travel. Kevin Hannam is Professor of Tourism Mobilities in the Business School at Edinburgh Napier University, UK, and a research affiliate at the University of Johannesburg, South Africa. In 2015/2016 he was awarded a Vice-Chancellor’s International Scholarship to the University of Wollongong, Australia. Previously he was at Leeds Beckett University, UK, and the University of Sunderland, UK.